Chicken and pieces of cheese are hand packed, and simmered in scrumptious gravy for a fresh and palatable dinner. Chicken and cheese served together to make a refreshing cat-food club sandwich, and simmered in scrumptious gravy for a fresh and palatable dinner. Feeding Instructions: An average 8-10 lb. 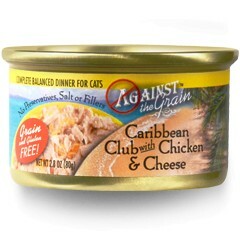 cat will eat about 3 cans daily. Adjust as needed for your cat's age and activity. Refrigerate unused portion up to 36 hours. Provide plenty of fresh water.